Filippello Park’s two athletic fields, picnic area, playground and more draw lots of visitors. Nearby residents complain that users are using all the parking in their neighborhood. 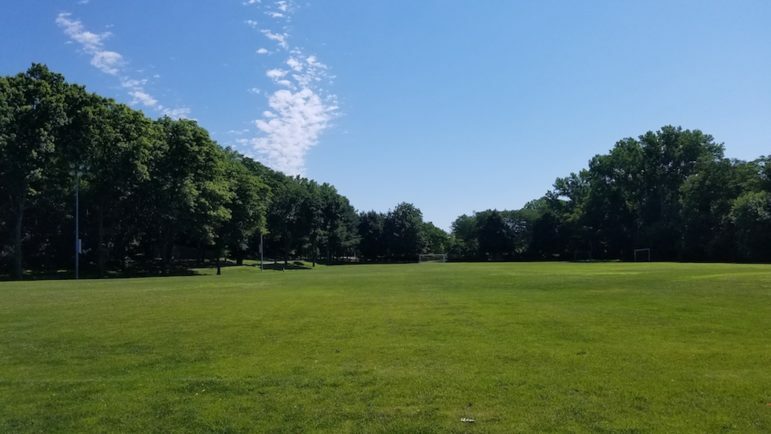 Neighbors of streets near Filippello Park have complained of parking problems and other issues related to users of the East Watertown park, and their Town Councilor is seeking some solutions. At meetings held in May, July and September, residents aired their concerns, much of which involved parking. District A Town Councilor Angeline Kounelis wrote an open letter to the Town Administration suggesting some steps to help residents of streets just south of the park — Clarendon and Berkeley streets — and the area of Arlington Street near Filippello Park. The residents of those streets have limited parking on their streets. There is a parking lot meant for the neighborhood on Glen Circle (which connects Berkeley and Clarendon streets) however the spaces are often used be people using Filippello Park when the park is open. It sits next to an entrance to the park, which Kounelis said was supposed to be limited to emergency access according to a 1983 agreement, but was opened round 1999 or 2000. Meanwhile, the Town is considering adding lights for the area of Filippello Park near Arlington Street and replacing the lights on the field on the Grove Street side. Residents worry that users will park in their neighborhood even later if the new lights are installed. To seize someones land under the color of law for the purpose of providing parking is unacceptable. The comic strip Small Saves makes its Watertown News debut this week. The strip has been featured in a number of places, including a national hockey publication. Project Literacy students sat down with members of Watertown Citizens for Peace, Justice & the Environment for a potluck meal recently. The following piece was provided by Watertown Citizens for Peace, Justice & the Environment: Watertown Free Public Library's Savings Bank Room was filled with joyful bustle last week as Project Literacy students from around the globe gathered with members of Watertown Citizens for Peace, Justice and the Environment to share food, culture and thoughts about peace.